The North America railway traction motors market is dominated by five players, namely Siemens AG, Alstom SA, ABB Ltd., Mitsubishi Electric Corporation, and Bombardier Inc. These five players collectively account for more than 50% of the North America railway traction motors market and are likely to retain steady dominance despite changes in the market position of several companies. The key strategies employed by the leading companies are a steady emphasis on continuous product development, allied to expansion of marketing and sales networks to suit the changing conditions of the market. Many key producers of railway traction motors in North America have also made significant advances overseas in recent years, which has added to their clout in North America. 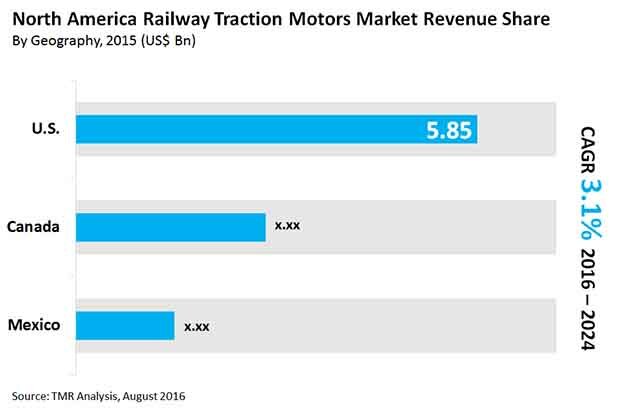 According to Transparency Market Research (TMR), the North America railway traction motors market is expected to rise to a valuation of US$13.2 bn by 2024. This represents growth at a steady 3.10% CAGR between 2016 and 2024. By motor type, the North America railway traction motors market is segmented into direct current (DC) traction motors, alternating current (AC) traction motors, and synchronous alternating current traction motors. Of these, alternating current traction motors are likely to account for a leading share in the North America railway traction motors market in the coming years. The segment is likely to account for more than 50% of the overall market by 2024, exhibiting a robust 3.5% CAGR from 2016 to 2024. Within North America, the U.S. is the leading market for railway traction motors and is likely to retain the position in the coming years due to the stable product development scenario in the country. Nevertheless, Canada is likely to play a major role in the development of the North America railway traction motors market in the coming years in spite of the incomplete electrification in the country. Canada’s passenger rail traffic has witnessed a steady rise in the last few years due to the country’s rising native as well as immigrant population. The rapid urbanization scenario in Mexico and the country’s rising economic conditions are likely to lead to steady growth of the Mexico market for railway traction motors as well. The key driver for the North America railway traction motors market is the rising demand for passenger convenience. Due to rising passenger traffic and the risk of rising competition in the railways sector, most railway service providers have focused on the ergonomics of their products to attract more consumers. Steady investment aimed at design changes is likely to benefit the North America railway traction motors market in the coming years. Electrification initiatives are strong in North America, which will also benefit the railway traction motors market in the coming years. The railway sector has also undergone significant changes in recent years due to the influx of environmental regulations, which have led to progressive design changes. The incorporation of technological advancements such as regenerative brakes and hybrid locomotives could also impact the North America railway traction motors market. The low need for replacement services has been a key restraint on the North America railway traction motors market in recent years. However, the steady progression of railway design is likely to lead to a steady need for product enhancements in railway traction motors. On the other hand, the North America railway traction motors market could suffer due to the long manufacturing times required for railway traction motors.